The Ferrari Mondial is a mid-engined, V8-powered grand tourer which was produced by Italian manufacturer Ferrari between 1980 and 1993. Offered with coupé and cabriolet bodystyles, it replaced the Ferrari 308/208 GT4 coupé and remains the last V8, rear mid-engined, 2+2 model Ferrari produced. The Mondial name (French for world or global) originated from Ferrari's motor racing history — the 500 Mondial was a successful lightweight sports racer of the early 1950s which was named to celebrate Ferrari's consecutive Formula 1 World Championships in 1952 and 1953. The name was revived as Ferrari won the Formula 1 World Constructors Championships in 1975, 1976, 1977, and 1979. The Mondial name was also chosen as it was an equivoque, the car designed to meet global safety and emission standards for 1980, compared to previous offerings. Conceived as a 'practical' Ferrari, the Mondial is a genuine long-distance four-seater, with sufficient rear head- and leg-room for children and smaller adults. It affords easy access via the long single doors, and has surprisingly good all-round visibility for a mid-engined car. The vehicle has a slightly higher roofline and greater all-round dimensions compared to its two-seater stable mates, resulting in a comparative weight penalty of around ten percent. The Ferrari Mondial is a mid-engined vehicle of the R-M-R configuration. It was produced in 2-door coupé and convertible (or cabriolet) forms, with all vehicles offering 2+2 passenger accommodation. 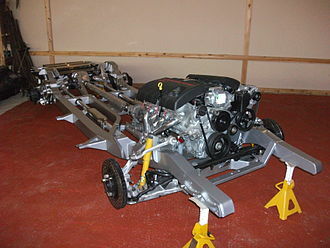 It was produced concurrently with Ferrari's 2-seater 308 GTB/GTS, 328, and 348 sports cars, and all major mechanical systems in the Mondial, including engine, transmission, steering and suspension, are either identical to, or very similar to, those used on the matching 2-seater vehicle being produced at the same time. 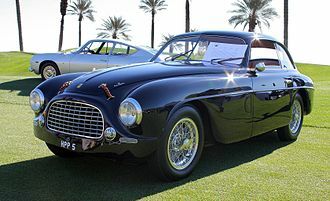 Pininfarina's bodywork was manufactured by Ferrari's regular coachbuilder Carrozzeria Scaglietti. 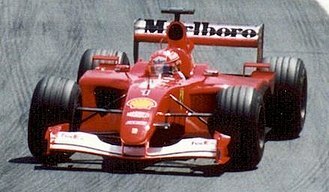 Its structure conformed with Ferrari's practice at the time, with outer body panels fitted onto a separate space-frame chassis constructed from tubular box or oval-shaped steel sections. While most body panels are steel pressings, the front lid and rear engine cover of the Mondial 8 and QV models are from aluminium. :64 Full-width aluminium louvre panels across the front lid and engine cover form a distinctive feature of all Mondials, and provide for improved airflow through the front-mounted radiators and engine bay respectively. At the front of the vehicle, a front-hinged lid encloses space for the spare tyre, radiators and cooling fans, battery (ahead of a wheel arch), heating and cooling systems and the vehicle's electric control systems. At the rear, a full-width, insulated and trimmed luggage boot with a gas-strut-supported lid sits behind the engine bay, sizeable enough to hold several sizeable soft bags or set of golf clubs. :73,74 Electrically actuated pop-up headlights fit flush to the vehicle nose, and contain twin round lamps in each for all 8, QV and 3.2 models, and a single homofocal rectangular unit each side of the Mondial t.
At their core, all Mondial engines comprise: a Ferrari-cast lightweight alloy V8 block with 90° bank-angle; shrink-fit cylinder liners; a five-bearing, flat-plane crankshaft with paired connecting rods on each journal; belt-driven, quad overhead camshafts (two per cylinder bank) acting directly on the valves; alloy crossflow cylinder heads; and a wet-sump lubrication system (excepting the Mondial t, which used a dry-sump system). :25–27,49–54,74 Engine capacity started at 3.0 l (180 cu in) for the Mondial 8 and QV models, increasing to 3.2 l (200 cu in) for the Mondial 3.2, and culminating in 3.4 l (210 cu in) for the Mondial t model. The orientation of the V8 engine block is quite different in the Mondial t compared to the earlier Mondials. Mirroring the two-seater Ferrari V8 vehicles, all 3.0 and 3.2 l engines sit across the car with their crankshaft and cylinder planes transverse to the main vehicle axis. The 3.4 l engine in the Mondial t (and 348 GTB cousin) is rotated ninety degrees to a longitudinal orientation with respect to the car. In operation, the Ferrari V8 displayed impressive characteristics for the time, with good specific power values (between 71 and 88 bhp/l), high maximum-rpm limits of 7700 rpm (3.0 and 3.2 l) and 7500 rpm (3.4 l), a flexible torque range, and an undeniably Ferrari exhaust note all combining to produce an excellent sports-touring engine. A five-speed, all-indirect manual transmission using a "dog-leg" selector pattern was the only transmission offered. Instead of the conventional "H" shift pattern, this arrangement (also known as a "reverse h-gate") has 1st gear situated to the far left and back, behind reverse. This pattern has been popular with racing gearboxes, as it allows quicker, more direct shifts between 2nd and 3rd, and 4th and 5th, gears. 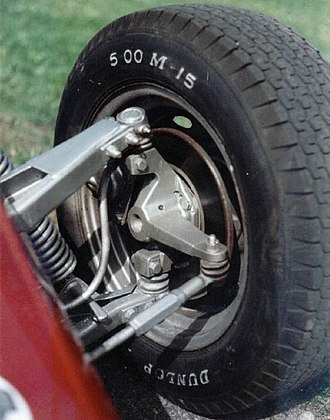 Output from the final drive to the rear wheels is via a pair of short, solid drive shafts fitted with constant-velocity joints at each end to allow for suspension articulation. Although based on the two-seater vehicle designs, Mondials are slightly larger overall including having appreciably wider front and rear track dimensions. :38,60 Suspension systems are fully independent all-round, comprising unequal-length upper and lower wishbones, coil-over damper units and anti-roll bars at each end of the vehicle. :77–78 Mondial t vehicles include a driver-adjustable selector to set the electronically controlled damper units, providing three choices of ride-stiffness adjustment. 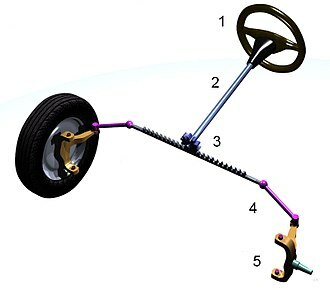 Steering is a rack-and-pinion mechanism sitting ahead of the front wheels, unpowered on all 8, QV and 3.2 models. Hydraulic power-assistance was standard on the subsequent Mondial t model. Braking is via four-wheel ventilated disks with split-circuit vacuum assistance on all vehicles. 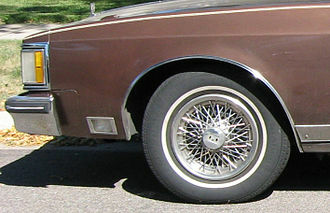 Anti-lock braking (ABS) was available as an option in 1987, and it was fitted as standard from 1988. The first Mondial iteration introduced as the Mondial 8 at the 1980 Geneva Auto Salon. It was the first Ferrari to depart from the company's simple 3-digit naming scheme, and some reviews found it relatively mild, compared to other Ferraris, regarding performance, drawing criticism from some in the motoring press. It used a mid/rear-mounted Bosch K-Jetronic fuel injection V8, shared with the 308 GTBi/GTSi, mounted transversely. 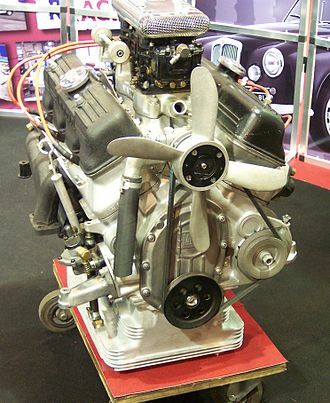 The engine used in the 1973 Dino 308 GT4. The K-Jetronic system is mechanical, with a high-pressure pump which streams fuel continuously to the injectors; it does not have a computer, just a few relays to handle the cold start sequence etc. The chassis was also based on the 308 GT4, but with a 100 mm-longer (3.9 in) wheelbase at 2,650 mm (104.3 in). The suspension was the classic layout of unequal-length double wishbones and Koni dampers all around. Mondial 8 Production started: 1980. Production ended: 1982. Total production: 703 (145 Right Hand Drive) - 147 Imported to US/CA First serial number: 31075. Last serial number: 41727. 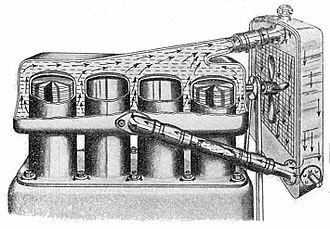 The first Mondial engine, although a DOHC design, used just two valves per cylinder. 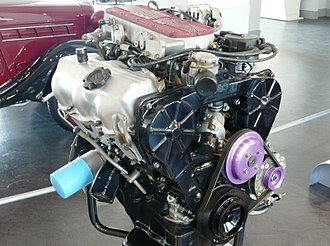 The 1982 Quattrovalvole or QV introduced a new four-valve head; the combustion chamber design purportedly based on the early eighties Formula 1 engine. 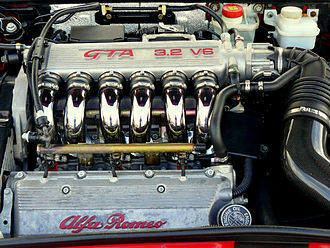 Again, the engine was shared with the contemporary 308 GTB/GTS QV, and produced 240 hp (179 kW). Appearance was largely as per the Mondial 8, although with red engine heads and prominent "Quattrovalvole" script at the rear. 1,145 coupés built between 1982 and 1985. Mondial QV Production started: 1982. Production ended: 1985. Total production: 1,145, (152 Right Hand Drive) - 69 Imported to US/CA First serial number: 48037. Last serial number: 55507. A new Cabriolet body style added for 1983. Body styling remained the same as the coupé variant, with the roof maintaining the 'buttress' design of the roof, though the Cabriolet required the rear seats to be mounted closer together laterally. The introduction of the Cabriolet saw the popularity of the Mondial rise, particularly in the American market, where the convertible body style was highly desirable. The Cabriolet has the added distinction of being the only four-seat, mid-rear engine, convertible automobile ever manufactured in regular production. 629 units were produced between 1983 and 1985, making this the rarest version of the Mondial. Mondial QV Cabriolet Production started: 1983. Production ended: 1985. Total production: 629 (27 Right Hand Drive) - 282 Imported to US/CA First serial number: 47247. Last serial number: 59163. 3.2 Mondial Cabriolet Production started: 1985. Production ended: 1988. Total production: 810, (57 Right Hand Drive) - 449 Imported to US/CA First serial number: 59393. Last serial number: 78895. The final Mondial evolution was 1989's Mondial t (Coupe and Cabriolet). It was a substantially changed model, "spearhead of a new generation of V8 Ferraris", according to Road & Track magazine. It was visually different from preceding Mondial models, the most recognizable being the redesign of the air intakes to a smaller rectangular shape. Additionally, the door-handles were of a visually different design, as were the front and rear bumpers which became body colored. New front and rear wings cover wider tracks and are re-profiled to a fuller shape compared to previous models, which feature a rolled lip. 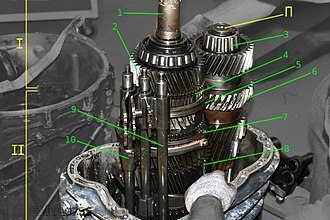 The 't' called attention to the car's new engine/transmission layout: the previously transverse engine mounted longitudinally while the gearbox remained transverse, thus forming a 't'. 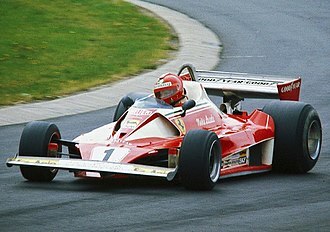 The 't' suffix was also homage to the first use of a transverse transmission by Ferrari in the highly successful Ferrari 312T, driven by F1 World Champion Niki Lauda. 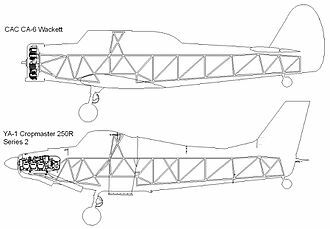 By adopting this layout, a longer engine could be mounted lower in the chassis, improving handling dramatically. 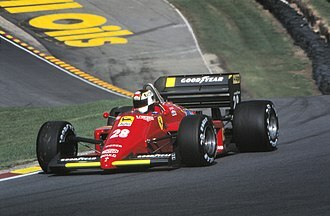 The 't' configuration was used by Ferrari's Formula One cars of the 1980s, and would be the standard for the marque's future mid-engined V8 cars, beginning with the 348, introduced later in the year. The transverse manual gearbox fitted with a Limited Slip Differential with a twin-plate clutch design with bevel gears driving the wheels. Later in production, a Semi-automatic transmission termed "Valeo" was available as an option; while shifting was using a traditional gear lever, the clutch was actuated automatically without a clutch pedal. The engine was up to 3.4 L (3405 cc) and 300 hp (224 kW). The engine controlled by Bosch Motronic DME 2.5 (later DME 2.7) electronic engine management that integrated EFI and ignition control into a single computer unit. 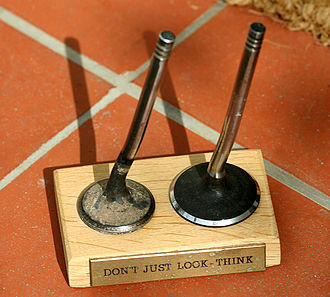 Two of these used in the car: one for each bank of the engine. Engine lubrication upgraded to a dry-sump system. The Mondial's chassis would underpin a new generation of 2-seat Ferraris, right up to the Ferrari 360, but the 2+2 Mondial would end production just four and a half years later in 1993. However, the "t" layout of the engine and transaxle, adapted from Ferrari's Formula One cars, continues to be used in mid-engined V8 model Ferraris to date, albeit with a more sophisticated chassis. The new layout saw the engine and transmission mounted on a removable subframe; the assembly removed from the underside of the vehicle for maintenance. 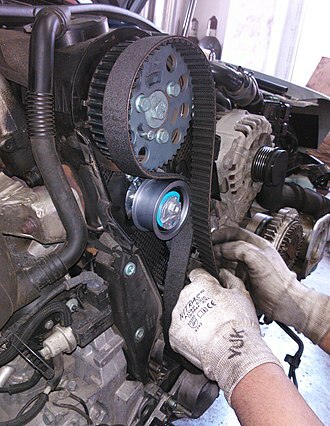 This process is necessary for timing belt replacement, making this a costly procedure for the owner who does not have a lift. On the other hand, the clutch was now located at the very rear of the drive train. This arrangement makes clutch replacement and service a simple, inexpensive, and readily owner-doable proposition. The "t" was home to other Ferrari firsts: It used power assisted steering for the first time and had a 3-position electronically controlled suspension for a variable tradeoff between ride quality and road holding. It also had standard ABS. The Mondial t represented the most substantial upgrade to the Mondial model line in performance and handling since its introduction in 1980. The "t" offered greater performance while retaining a mid-engined layout and a practical packaging layout, and was once again, favorably received. The company has not produced a mid-engined 2+2 car since then, leaving the 2+2 configuration to the more classic front-engined design starting with the 456 in 1992. As of 2018, the V12 GTC4Lusso and both the twin-turbocharged V8 GTC4Lusso T and Portofino are the company's only 4-seat vehicle offerings, but both of these are front engined, leaving the Mondial t as the most modern 4-seat, mid-engined, Ferrari yet produced in 25 years. Mondial t Coupe: Production started: 1988. Production ended: 1993. Total production: 858 (45 Right Hand Drive) - 43 Imported to US/CA First serial number: 79596. Last serial number: 97698. Mondial t Cabriolet: Production started: 1989. Production ended: 1993. Total production: 1,017 (51 Right Hand Drive) - 379 Imported to US/CA First serial number: 80399. Last serial number: 97733. 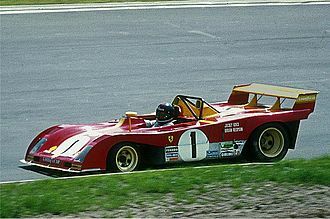 A Mondial-t was manufactured exclusively by Ferrari for PPG Industries to use as a pace car for the PPG Indy Car World Series. Built under the design of I.DE.A Institute at a cost of approximately $1 million, it was introduced at the 1989 Champion Spark Plugs 300 in Laguna Seca. 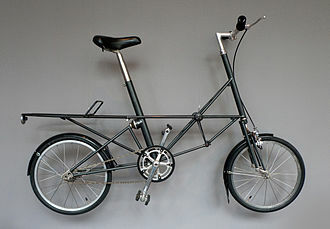 The vehicle used Mondial t chassis 76390 as its basis, and included significant external body modifications in its design. In 2004, one of its examples was offered at a Christie's auction held during the 2004 24 Hours of Le Mans, where it sold for €70,500. The Mondial 8 received a mixed range of reviews upon release; the automotive press was unanimous in their accolades of the Mondial 8's road manners, but a number of sources were quite critical of the vehicle's performance, especially when compared to earlier or concurrent Ferrari models. In more recent times, several retrospective articles have rated the Mondial 8 poorly, with Time magazine going as far as including the Mondial 8 in their list of the 50 worst cars of all time. It seems likely that the stigmas bestowed upon the Mondial line trace to a few negative articles written about the early Mondial 8. Three top US automotive publications (Motor Trend, Car & Driver, and Road & Track) all published reviews of the Mondial 8 in the fall of 1981. Road & Track and Car & Driver reported comparatively disappointing performance results. Road & Track noted a faulty gear selector which may have contributed to the overall poor showing. Car & Driver received a pre-production model, which may have contributed to poor performance. Motor Trend's review was much more favourable, and recorded performance on par with the 308 GTBi/GTSi and Porsche 928. There was never any definitive conclusion on these performance disparities; Automobile magazine has suggested that the vehicle's engine being new (not "broken-in") as the reason their observed 0-60 time was below expectations, since the sample vehicle tested by Motor Trend had an engine with significantly greater mileage. The Quattrovalvole was better received by the automotive press and the public, although some of the previous poor reviews for the Mondial 8 engendered negative perceptions that would follow the Mondial line throughout its life. With its one-of-a-kind Pininfarina derived design; everyday versatility, the Mondial has amassed a cult following of enthusiasts. It historically has not received widespread admiration however and is sometimes the target of derision due to what many consider the compromises (4 seats and heavier weight) Ferrari undertook creating the car in both form and function. Some early negative reviews for the first model, the Mondial 8, has often been repeated by derivative articles that further tarnished the Mondial image across the subsequent six iterations. Many current enthusiasts have welcomed the contrary views, as it has allowed the price of the model to remain relatively stable and Ferrari ownership and parts manageable, many speculate (and some lament) that it will inevitably rise significantly in value. The Mondial has also garnered more positive press in recent media. In my car collection, I have a Mondial QV... I love my Mondial with a passion. My car guy pals think I'm just a little bit strange, why you got a Mondial QV? Because it's just a cool car. What they don't understand is that I need cars to communicate with me....and it puts a smile on me face. This really is a cool car. In 2012, Top Gear reviewed a 1980 Mondial 8, nominating the Mondial and the F50 as the two Ferrari contenders for "the worst car in the history of the world." James May compared it to "Lennon & McCartney's Eggman - rubbish," criticized the performance, handling, and interior space, and stated that anybody who bought one would be "bitterly disappointed." Jeremy Clarkson decided that the F50 was a "worse catastrophe in Ferrari's history." In regards to performance, there was a question of the straight line speed for only the first model, the United States variant (which had additional performance inhibiting emissions control equipment) of the Mondial 8 (80-82). The United States variant of the Mondial 8 represents only 147 (or 2%) of the over 6,000 examples produced during the vehicle's lifetime. There were three formal road tests for the United States variant of the Mondial 8 in 1980. Two trials (Car and Driver/Road & Track) lamented straight line speed, one (Motor Trend) test applauded it. Handling is universally praised by the press at the time for all models (including the Mondial 8) and straight-line performance on par with other exotics for all subsequent iterations. Reliability is another common critique. The Mondial 8,qv, and 3.2 lines shares the exact powertrain and many parts as the 308/328, both regarded as the more reliable Ferrari. The Mondial is often described as the 'entry-level' Ferrari. The reality is the Mondial was substantially more expensive than the 308/328 when new. The view of the Mondial's aesthetics has always been a matter of debate. Given the subjective nature of visual design, it is the one criticism that has merit based only on personal judgment. I think it's Ferrari's most elegant car...the Mondial's shape is perfect...In short, the Mondial is the one Ferrari that causes heads to turn in appreciation rather than shock. The styling of the Ferrari Mondial Coupe indeed of most Ferraris is best described as timeless; the Pininfarina penned lines still look fresh after eleven years and have influenced the design of sports cars from Detroit to Tokyo. "At its launch in 1980, the Mondial 8 was criticized for its styling, weight and lacklustre performance, but time has been kind to the eight-cylinder Fezza. In fact, the restrained styling is central to its appeal." ^ a b c d e f g h i j k l m n o p q r s t u v w x y z Bluemel, Keith (1997). Original Ferrari V8. The Restorer's Guide to all models 1974-94. Devon, England: Bay View Books, MBI Publishing. ISBN 1-870979-78-8. Retrieved 3 October 2016. ^ a b c d e Ferrari. "Past Models - Ferrari Mondial 8". auto.ferrari.com. Retrieved 12 October 2016. ^ a b c Ferrari. "Past Models - Ferrari Mondial Quattrovalvole". auto.ferrari.com. Retrieved 12 October 2016. ^ a b c d e Ferrari. "Past Models - Ferrari Mondial 3.2". auto.ferrari.com. Retrieved 12 October 2016. ^ a b c d e f g h i j Ferrari. "Past Models - Ferrari Mondial T". auto.ferrari.com. Retrieved 12 October 2016. ^ Ferrari. "Ferrari Owners Manual - Mondial 8". www.unevoiture.com. Retrieved 15 October 2016. ^ Ferrari. "Ferrari Owners Manual - Mondial QV". www.unevoiture.com. Retrieved 16 October 2016. ^ Ferrari. "Ferrari Owners Manual - Mondial 3.2". www.unevoiture.com. Retrieved 16 October 2016. ^ Ferrari. "Ferrari Owners Manual - Mondial t". www.unevoiture.com. Retrieved 16 October 2016. ^ "MotorTrend 1981 Review" (PDF). ^ "Motor 1982 Mondial QV Review" (PDF). ^ "Car and Drier 1987 Review" (PDF). ^ "Autocar Full Road Test 1992" (PDF). ^ a b Bluemel, Kieth. 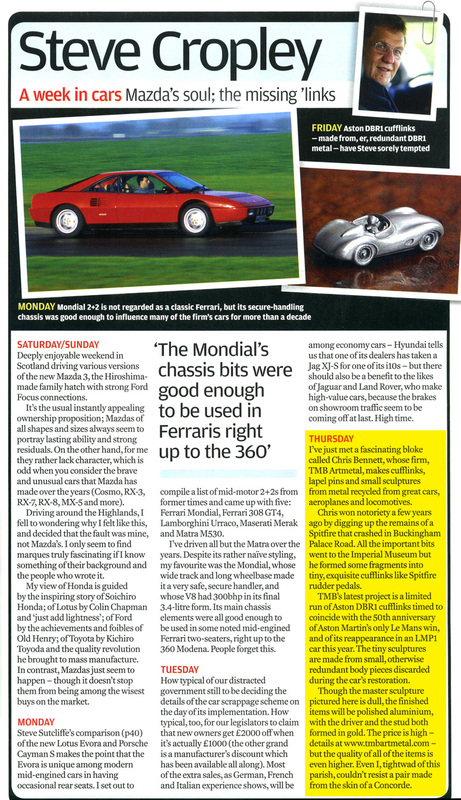 Mondial The Affordable Ferrari? (Magazine scan). Unique Motor Books. p. 54. ISBN 978-1-84155-584-3. ^ a b "Ferrari Mondial 8 Review" (PDF). roadandtrack.com. Retrieved 2015-07-15. ^ a b "Ferrari Mondial 8 Review" (PDF). caranddriver.com. Retrieved 2015-07-15. ^ a b c "Ferrari Mondial 8 Review" (PDF). motortrend.com. Retrieved 2015-07-15. ^ Büschi, Hans-Ulrich, ed. (8 March 1990). Automobil Revue 1990 (in German and French). 85. Berne, Switzerland: Hallwag AG. p. 262. ISBN 3-444-00495-8. ^ "1989 - 1993 Ferrari Mondial T Review @ Top Speed". Top Speed. Retrieved 2017-08-21. ^ a b "Ferrari Mondial T 'Speciale' Pace Car | Christie's". Christies.com. Retrieved 2015-07-15. ^ "Ferrari Mondial Buyers Guide". drive-my.com. 2015-09-01. Retrieved 2015-10-29. ^ "Motorsport Mondial 8 Handling" (PDF). ^ "Road Test Mondial 8 1982" (PDF). ^ "Road and Track 1981 Test" (PDF). ^ "Motor Trend Test" (PDF). ^ "Car 1981 Mondial Test" (PDF). ^ "Mondial 8 Review" (PDF). autoweek.com. Retrieved 2015-07-15. ^ "Road and Track 1984 Mondial QV" (PDF). ^ "Car Magazine Mondial QV Review" (PDF). ^ "Motorsport 1983 Mondial Review" (PDF). ^ "AutoCar 1986 Mondial 3.2" (PDF). ^ "Ferrari Fantasy Road and Track" (PDF). ^ "Car and Driver 1987 3.2 Mondial Review" (PDF). ^ "Road and Track Mondial t 1991" (PDF). ^ "Car and Driver Review Mondial t" (PDF). ^ "Automobile 1989 Review" (PDF). ^ "Car Magazine 1989 Review" (PDF). ^ "Motorsport 1992 Review" (PDF). ^ "Road and Track 1990 Review" (PDF). ^ "Car Magazine Review" (PDF). 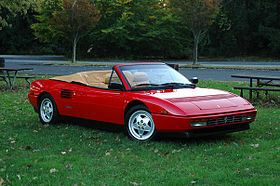 ^ a b "Motorweek and the Ferrari Mondial t coupe". ^ "1990s Ferraris and an Alfa with only 2,600 miles from new". telegraph.co.uk. Retrieved 2015-07-15. ^ "Outrageously High Price Tags". ^ "Hagerty's 10 Future Classics to Buy Right Now". ^ Golseth, Andrew. "Is This Mondial Your Affordable Entry Into Ferrari Ownership? - Petrolicious". Petrolicious. Retrieved 2016-06-07. ^ "How to buy a supercar: Autocar's expert guide | Autocar". www.autocar.co.uk. Retrieved 2017-10-15. ^ "1991 Ferrari Mondial". "https://auctionata.com". Retrieved 2015-09-29. ^ "Automobile Mondial 3.2 Review" (PDF). The characteristics of a production vehicle or production car are mass-produced identical models, offered for sale to the public, and able to be legally driven on public roads. 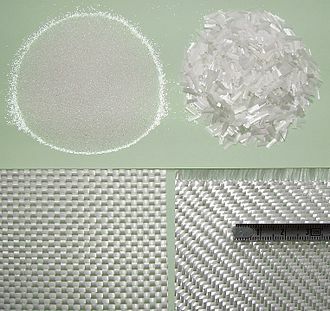 Legislation and other rules further define the vehicle within particular countries or uses. There is no single fixed global definition of the term, in 1896 the term production car was used to describe a railway carriage that carried the scenery for an opera company. The earliest use of the production car being applied to motor cars. The phrase was a form of mass-produced or quantity-produced car. The phrase was used in terms of the car to be made in production. At that time production cars referred to cheaper vehicles such as Model Ts that were made in large numbers on production lines. Now the term has broadened to include vehicles that are hand assembled, the main criteria being that there are a number of the same model with the same specifications. For example, Guinness recognises a modified 2-seat Jaguar XK120 as the worlds fastest production car in 1949. By 2011, the Guinness Book of Records listed the Bugatti Veyron Super Sport World Record Edition as the worlds fastest production car, in 2013 their decision was appealed on the ground that the Bugatti was a modified version - the limiter was turned off. Guinness upheld the appeal and initiated a review of their production car definition, the outcome of the review was that turning off the limiter was not a fundamental modification and the Bugatti record was reinstated. Guinness were reported in sources as saying that at least 50 identical vehicles were needed to be made to constitute a production car. In February 2014, Road and Track wrote that Guinness required 30 identical vehicles, there have been numerous disputes over what constituted production and modified cars when used in motorsports. Even under Fédération Internationale de lAutomobile, the definition of what was a production car was unclear and controversial. Although the term is defined for types of vehicles. However, FIA rules tend to allow a degree of modification from the original, another example is the Utah Salt Flats Racing Association, which is concerned solely with the speed of a vehicle, uses its own definition of a production vehicle. 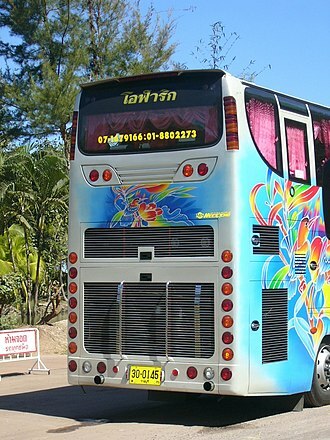 Extensively redundant rear lighting installation on a Thai tour bus.